London, 11th April 2019 – The BPI’s annual yearbook All About the Music is published today and gives a detailed insight into the year in UK recorded music in 2018 through facts, figures and analysis. Compiled by Rob Crutchley and edited by Chris Green, and featuring an introduction by BPI CEO Geoff Taylor, this authorative BPI industry book fully evaluates music consumption and trends, with chapters covering sales, market breakdowns, consumer behaviour, retailing and how British music is performing in the world market, along with many other insights. “In an age where entertainment consumption is increasingly fragmented, and with ever-fiercer competition in the attention economy, music demonstrates time and again that it has the power and appeal to cut through and engage people’s passions. “Streaming offers more dazzling choice of music than ever for audiences, but every now and then a body of work will strongly resonate with fans. Adele’s 25 and Ed Sheeran’s Divide are two recent examples – albums that captured the public’s imagination, combining relatability with classic song craft. In 2018 another set of songs can be added to that pantheon – the soundtrack of The Greatest Showman. Its dominance of the UK charts was remarkable: 24 (non-consecutive) weeks at number one, eight tracks from it featuring in the year-end top 100 singles chart and over 1.6m copies sold. Both The Greatest Showman and A Star Is Born showed that music and film can combine to powerful effect, but the success of Mamma Mia! Here We Go Again and Bohemian Rhapsody reminds us that older songs too can have a broad, pan-generational appeal. 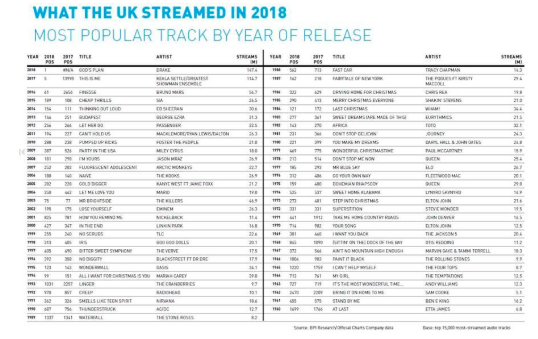 As a key take out, here we highlight what UK consumers streamed in 2018 - and in the process underscore the public’s passion for new music as well as its enduring love affair with classic catalogue. While streaming data gives us a valuable verdict on which freshly-released tracks are the most popular, it also delivers important insight into what older music is currently resonating with the UK audience. This report attempts to ascertain how popular these older tracks are not only in relation to new music, but also what micro-trends are developing. The revival of interest in these catalogue tracks and albums reveals much not only what standing these classics have in our overall listening but also how we are (re)discovering and uncovering new gems from our rich musical heritage. Streaming continues to grow in popularity. In 2018 over 90 billion plays took place on audio streaming services, an increase of 33.5% on the 2017 total, and we are now regularly seeing 2 billion streams per week occur. BPI’s 2018 analysis looked at the 15,000 most-played tracks of the year and assigned a ‘year of release’ to each, corresponding to the first day it was made publicly available. Perhaps unsurprisingly, tracks that were released in 2018 dominate the upper echelons of the annual chart. Tracks by Drake (God’s Plan), Calvin Harris & Dua Lipa (One Kiss, right) and George Ezra (Shotgun) comprise the top three, with over 412m plays between them. Tracks originally released in 2017 also occupy quite a few of the high positions, such as those from The Greatest Showman (the soundtrack of which was made available in December 2017), Ed Sheeran’s Divide and Dua Lipa’s self-titled debut album. Tracks released in 2018 collectively accounted for 23% of all plays, with those first released in the year before comprising 20%. Definitions of ‘catalogue’ vary, but for the purpose of our analysis we have defined it as any track released in or before 2016. Cumulatively, these songs were responsible for well over half (57%) of plays on audio streaming services in 2018. Streaming is undoubtedly changing the landscape of music discovery. While new music can now potentially be found, heard, liked and 'saved’ instantaneously, equally tracks can take much longer to break and momentum can take a while to build. Campaigns are being built over a significantly longer period than before and this steadier growth means that slightly older tracks now carry a greater weight of importance in analyses such as these than they might have done before. Broadly the pattern is the same, however - collectively, tracks from the most recent years account for the greater share of plays. Kooks’ Naive - the most-played track from that year - and Snow Patrol’s Chasing Cars) that accumulated the greatest play count. Tracks from between 2010 and 2016 accounted for almost half (45.8%) of catalogue plays, with two appearing in the top 100. Bruno Mars’ Finesse was the highest-placed catalogue track, at number 61 - originally released in November 2016, a remix featuring Cardi B boosted its popularity. Post Malone’s I Fall Apart (also from 2016) was the second most-played catalogue track, and was placed at number 64. The Killers’ Mr Brightside has become something of a phenomenon. Released in 2003, it was again the most-played track from the 2000s and the third most-streamed catalogue song in 2018. It still frequently makes the top 100 on the weekly Official Singles Chart and was again placed within the top 100 (at number 75) of the 2018 year-end streaming chart. Several songs from the 2000s were played over 20m times in 2018, including tracks by Jason Mraz, The White Stripes, Eminem and Beyoncé. In a decade famous for Britpop and The Spice Girls it was a Christmas tune that was the most popular. Mariah Carey’s All I Want For Christmas Is You was the both the most-played of the 1990s and the most-streamed Christmas track from any era (see table below for top 10 Christmas tracks). Like Mr Brightside it too made the top 100 of the 2018 chart (at number 99) and in the final week of the year it was the most-played track in the UK. Two tracks by Oasis (Wonderwall and Don’t Look Back In Anger) were the next most-popular from the decade, with hits by TLC, Goo Goo Dolls and Nirvana also among the most played. Songs released in 1984 accounted for the biggest share of that decade’s plays and one of those was the most popular track of that entire period: Wham!’s Last Christmas. That year also saw big releases from Band Aid and A-ha. Hits from Fleetwood Mac (Everywhere, 1987), Whitney Houston (I Wanna Dance With Somebody, 1987) and Eurythmics (Sweet Dreams (Are Made Of This), 1983) all charted within the year-end top 300. Whereas Earth Wind & Fire’s September was the most-played track from the 1970s in 2017, in 2018 the honour fell to Queen’s Bohemian Rhapsody, from 1975. ELO’s Mr Blue Sky (1977) was second, with another Queen track (Don’t Stop Me Now) in third. Songs from 1977 accumulated the greatest play count with tracks from Fleetwood Mac (who released their Rumours album in February of that year), The Eagles (Hotel California, 1976) and Stevie Wonder (Superstition, 1972) ranked highly. The 1960s accounted for only 4.1% of all catalogue plays, but 13 tracks were played over 10m times, including Van Morrison’s Brown Eyed Girl (1967), Neil Diamond’s Sweet Caroline (1969) and Jimi Hendrix’s All Along The Watchtower (1968). Only one was played over 20m times, however - The Jackson 5’s I Want You Back, which as in 2017 was the most-played song from the sixties. Naturally there’s no fool proof way to propel catalogue tracks to success, but some patterns do emerge from the analysis. Aside from the general comfort of nostalgia, perhaps the most obvious reason behind some tracks’ success is their association with Christmas. 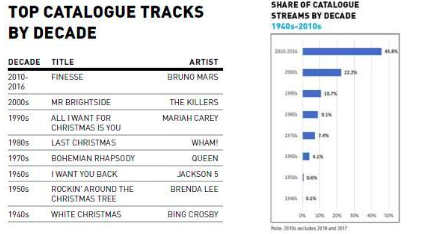 Our analysis estimates there to be almost 150 Christmas-themed (or associated) catalogue tracks among the 15,000 most-played songs of the year, While their collective play count only amounts to around 3% of the total, 25 were played over 10m times, including tracks by Elton John, Chris Rea and Slade. A connection with film & TV is often a contributor to interest in a song increasing. The most obvious example of 2018 is the success of the Queen biopic Bohemian Rhapsody - not only did the title track become the most-played song from the 1970s but nine of their songs charted in the streaming top 1,000 at year-end, compared to just four in 2017. The Spinners’ Rubberband Man (used in the film Avengers: Infinity War) enjoyed a boost in plays as did Pat Benatar’s We Belong (which featured in Deadpool 2). Fat Les’s Vindaloo, New Order’s World In Motion and Baddiel & Skinner’s Three Lions all saw big spikes in popularity around the time of the World Cup (the latter rising to number one on the weekly singles chart), while John Denver’s Take Me Home Country Roads achieved greater recognition through its usage in the game Fallout 76. Toto’s Africa was already one of the bigger catalogue tracks but it moved into the overall top 150 in 2018 after a year where it was shared intensively online and was also the subject of a social media campaign to persuade the band Weezer to cover it (which they duly did). CD Baby will be taking over Best Before @ Constellations on Saturday 4th of May for a day of artist showcases, happy hour drinks and DIY artist education sessions featuring many excellent industry speakers. Our mission is simple: we help musicians make money from their music. Today there are more ways to do that than ever before. and the go-to resource for educational information concerning music promotion, distribution, and rights management. In 2018 CD Baby opened their first UK and European office in London. Join us from 2pm when CD Baby will be hosting DIY artist educational sessions that will teach you successful release strategies, how to cut through the noise and get press as a DIY artist, and the ins and outs of playlists. From 5.30pm there will be amazing live performances, showcasing the best of CD Baby and local talent. 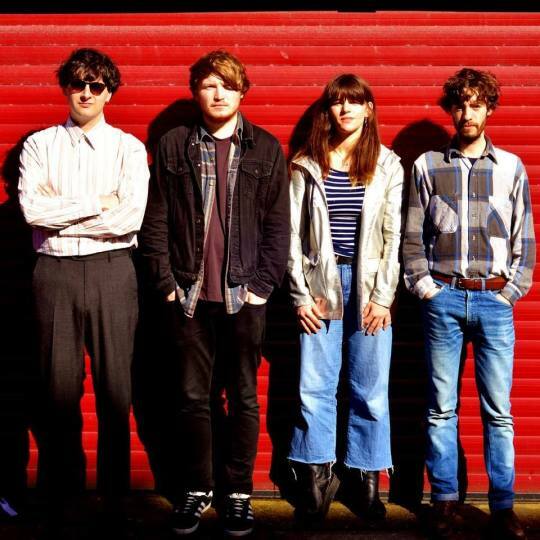 15.00-15.45 We don’t need any more indie bands: do we neglect the role of alternative forms of music, arts and comedy in Liverpool’s cultural identity? 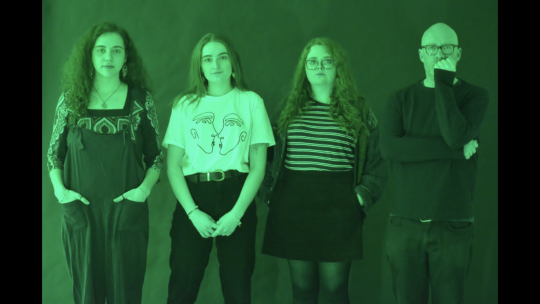 Sound City works with its Cultural Education partner LJMU to give their students from many different study areas opportunities to gain work experience, perform and showcase their ideas from their chosen discipline. Art_No- TwG are a sound video and performance collective that concern themselves with mime, gesture and improvised noise. Over the last year, we have been putting on ‘happenings’ around Liverpool with the intention of providing a platform for local artists to lead collaborative events. We are also interested in the manipulation of sourced imagery and found footage, through which we aim to challenge the construct of live and prerecorded performances. Lodge Soundscapes of noise harsh too soft with apocalypse folk elements to change the understanding of ritual and the self. The talented PULSS Film Team will be back again covering all the exciting music and performances across the weekend! Cool Artwork will decorate the Sound City landscape by students from LJMU Graphic, Illustration and Art courses who have won competitions. We will also have artwork by Fine Art student Ian Colligan that will be used to create a Photo Opportunity wall for all Sound City attendees. Entrepreneurship Challenge gives students the opportunity to pitch and even showcase their business ideas at Sound City. Winners this year were from the Marketing BA course who came up with vegan glitter, cocktail toppers, DIY car kit and a metal straw. 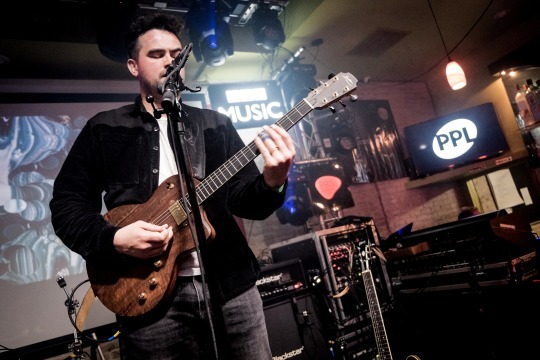 PRS for Music is the UK’s leading performing rights organisation, making sure songwriters, composers and music publishers get paid whenever their music is streamed, downloaded, broadcast, performed and played in public. 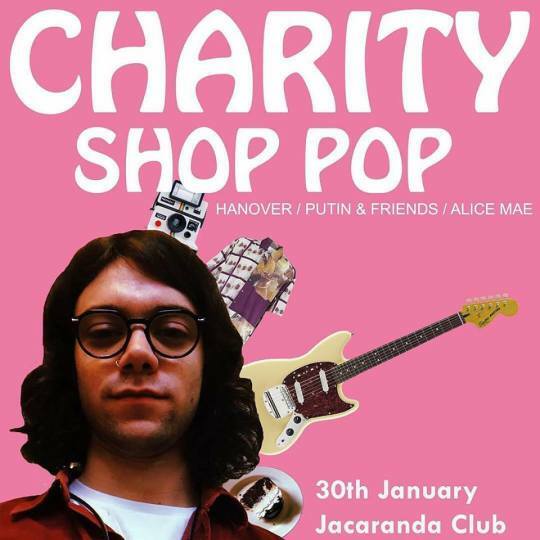 We champion our members’ rights and support the creation of music, which is why we’ve teamed up with PPL for a special panel with The Magic Gang, exploring everything you need to know about getting paid when you get played. On Friday 3 May from 1.10 - 1:55pm, we’ll be discussing how royalties are an integral revenue stream for any artist, as well as giving practical advice on how to further a career in music. We’d also love to see you at our after-party, taking place at Love Lane Brewery on Friday night, to kick off the live festival weekend! PPL is the UK’s music licensing company for over 100,000 performers and record labels. Along with our friends at PRS for Music, we will be hosting a panel (Friday 3 May 1.10pm – 1.55pm) with The Magic Gang to discuss how revenue flows back through to the artist. Delegates are welcome to join our drinks reception at Love Lane Brewery which will mark the close of the Sound City+ Conference and kick off the live festival weekend! We will be around all weekend, so come and join us to find out how we can support you to earn money from your music when it is broadcast on television, radio and played in public. The Sound City + 2019 announcement is here! Join us for three FULL days of in-conversations, workshops and exclusive insights into the music industry! As it is International Women’s Day, we thought we would talk about an issue very close to our hearts. According to a regular survey undertaken by Pitchfork across 19 festivals in 2018, acts with at least one female made up only 30% of the line ups! This does not reflect the plethora of female talent that is thriving in the UK and US. Thus, we feel that more action must be taken to redress the balance and make music festivals of the future more inclusive for both the audience and the artists that play them. It is for this reason that we decided to join the Keychange project to attempt to tackle this issue. Keychange is an international campaign led by PRS Foundation and supported by the Creative Europe programme of the European Union. The project invests in emerging female talent whilst encouraging festivals to sign up to a 50:50 gender balance pledge by 2022. They also run many collaborative projects throughout the year, most recently, the equalising music pledge with Smirnoff and Annie Mac (find out more). The Keychange network of festivals are making a gender balance commitment which makes sense to their own events. That is why, the leading Keychange partner, we are not only reaching for a 50:50 balance in our music festival, but also at Sound City+ our music conference. This year’s Sound City+ conference sees over 25 female industry professionals join us at the BME to share their experienced wisdom and discuss some of the key issues present in the music business of today. With some very huge industry females such as; Lucie Caswell from Featured Artist Coalition, Parlophone’s Komali Scott-Jones, Island Records’ Adele White and so many more names already announced with even more to be announced… 14/03/2019 - 10am. In addition to that, we are very happy to have 56% of our Liverpool Sound City office, female too! Despite recent movements such as #MeToo that have aimed to expose the mistreatment of women, the music industry is still known to harbour an oppressive and narcissistic view towards women. According to recent studies, women make up only 16% of all artists, 12% of all songwriters and 3% of all producers. SHESAID.SO are an organisation comprising of women from across all sectors of the industry. Their vision is to connect and empower marginalised communities in the music industry with a focus on women’s rights. 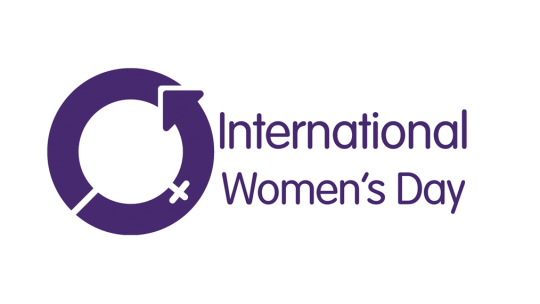 To celebrate International Women’s Day we spoke to one of their management team, Ellie Giles, about the empowering project. Before starting her own company, Step Music Management, Ellie spent 7 years in A&R at Fiction/Polydor working with artists such as White Lies and Ellie Goulding. She kindly took the time for a quick chat ahead of her appearance at Sound City+ 2019. Could you tell us what exactly is SheSaid.So? EG: SheSaid.So is an international community across the globe, with active chapters in places such as london, NY, Amsterdam, Mumbai. We bring together women from many sides of the industry to connect and empower them, educate and inspire. How did you become involved in SheSaid.So? EG: The founder, Andreea and myself were on a panel at M for Montreal on mental health around 2 years ago, and we realised we had very similar values. She asked me to get involved. It was such an easy answer for me. I was honoured. How relevant is your ‘Women in A&R’ panel to 2019 and what can we expect learn from that at Sound City+? EG: Before management I was in A&R at Polydor / Fiction, around that time (2004 - 2010) there were no women in positions of power in records A&R. Having no-one to look up to or ask advice was really hard. Today, there are so many amazing women in A&R across all labels and publishing, from major to indie. A&R is about understanding, listening, perseverance and vision these are all qualities women as well as men have. We need to celebrate that. And say to younger women, you can do this too, there is no barrier. Come in and be part of it. I see this is a giant hug. You’ll learn in the panel about what it’s like to be an A&R and particularly a women A&R. Their Loves, their losses and what they have learnt from being in A&R and what we can do to make sure more women stay in the A&R industry and move up the ranks. Who is your female icon & why? EG: Michelle Obama - what a woman! She’s firm, sure footed, kind, compassionate but also very strong without taking from others. A lady with morals and understanding. But also someone who knows her own mind whilst being hugely respectful to others. If i can be half the woman she is then i’m doing a good job. What act/s are you most excited for across the Sound City weekend? EG: Two artists I hugely admire are Our Girl and Gwenno. 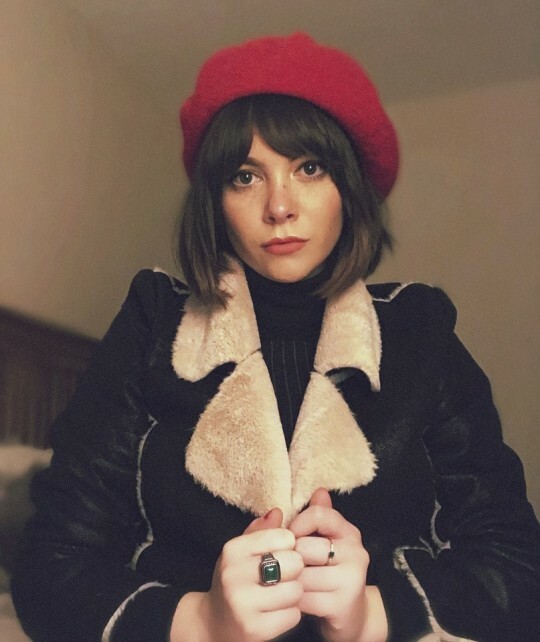 Our Girl was produced by my client Bill Ryder - Jones and soph is such a wonderful writer. They are so great live Gwenno makes such fresh sounding albums; having already carved out both a welsh and cornish language album. Love that she challenges the norm in musical terms. i’m excited to see what she does with both sides now. Find out more about SheSaid.So’s ‘Women In A&R: How The Game Has Changed’ panel here. Innovative app developer PixelBeard is the latest digital business to arrive at the Cotton Exchange in Liverpool. PixelBeard designs bespoke mobile app experiences for iOS and Android devices, helping clients to reach customers via mobile technology and maximise their success in the App Store. It has taken a 1,250 sq ft space in the Bruntwood - owned building following a period of sustained growth, which has included instructions from clients including Universal Studios, Sony Playstation, Channel 4 and Aircharge. Bruntwood has sensitively transformed the historic Cotton Exchange in recent years, attracting scores of innovative businesses from the digital and creative sectors. The company is currently refurbishing the reception area to create a new refreshments area, meeting rooms and a series of collaboration and breakout spaces. 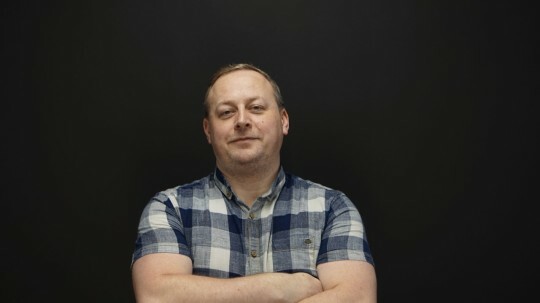 Will Roberts at PixelBeard, said: “We pride ourselves on creating exquisite mobile-first digital products so we wanted a workspace that would reflect our business and give us somewhere to develop our client offering in the coming years. Tony Reed, head of commercial at Bruntwood, said: “We are committed to creating vibrant, contemporary workspaces where ambitious businesses can flourish; that’s what we continue to deliver at the Cotton Exchange and it is great to welcome another excellent addition to the building. The first Sound City+ announcement is here! We are delighted to announce the speakers who will be joining us across the 3rd - 5th May! We return to the British Music Experience at the renowned Cunard Building then moving across various locations in The Baltic Triangle to share exclusive insights with the most exceptional names in the industry right now! For more information, head to: http:///plus.soundcity.uk.com. The INNOVATION NETWORK OF EUROPEAN SHOWCASES, or INES, is a European cooperation project initiated by eight international showcase festivals – including Westway LAB – and gigmit, the European digital platform for artist booking. Currently, INES has expanded to twelve showcase festivals. Showcase festivals are national music industry events that provide a platform for artist discovery, business networking and education. They combine live music performances, conference programmes and trade shows. This makes them the innovation hubs of the music industry. Whether it’s about artist discovery, professional education or capacity building, it all happens there. By connecting those hubs, INES will create a united and strong European music market. Be seen by Europe’s tastemakers when it comes to talent discovery and apply for all INES showcase festivals easy and online with a few simple clicks. Many showcase festivals that receive band applications are now available in one spot for all European artists. This programme will enable young talents to get equal European exposure and the chance to build their international careers by showcasing around Europe. INES partners nominate around 10 promising young talents from their own country to rotate through participating festivals in Europe. Music professionals are the key drivers of the music industry. INES#pro is a funding programme that supports professionals to attend all those great European showcase festivals out there, to discover bands, create personal networks, be educated and craft powerful synergies. Education is the foundation of a successful industry. INES aims to make knowledge more sustainable and accessible to everyone in the music business by filming panels, workshops, presentations and discussions that happen live at the INES showcase festival conferences and creating an open source video library for music business education. We are so excited to announce the curators for our sister event, #OTRMCR 2018! 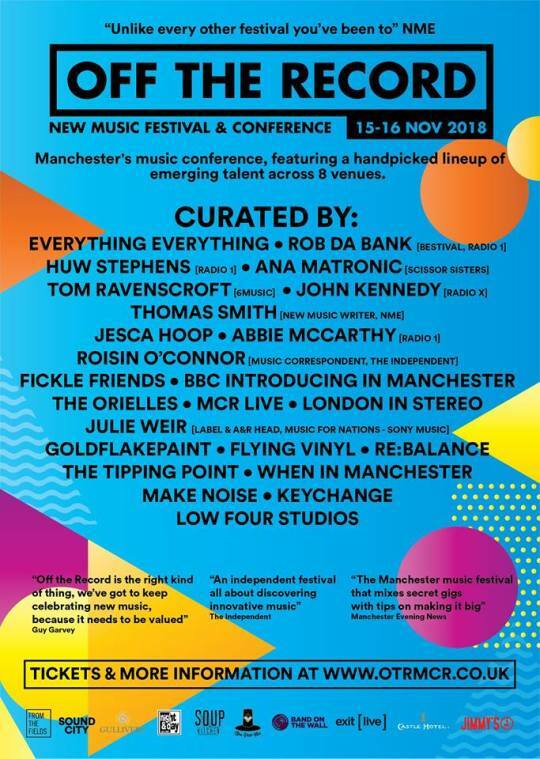 Off The Record will be back again in Manchester 15th-16th November 2018 for a full day of panels & workshops and an evening of live music hand-picked especially by our music industry curators. 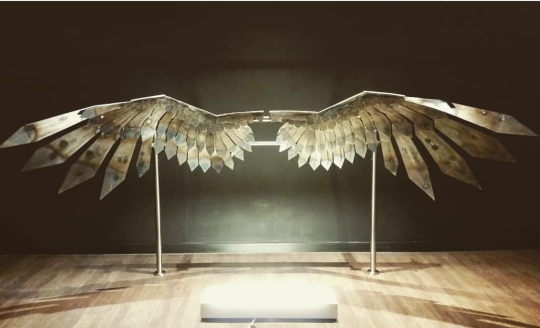 Artists can now apply to showcase at two of South Korea’s most important industry events, MU:CON and Zandari Festival, as part of the Sound City Korea initiative. 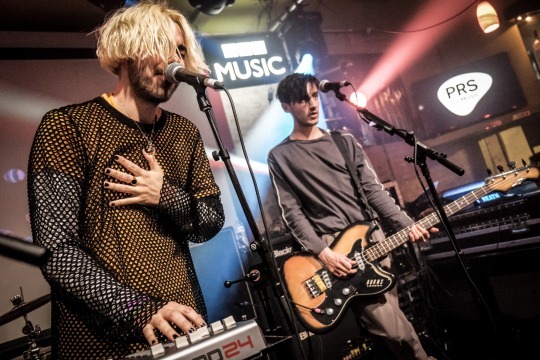 Supported by Arts Council England, this is the fourth year that Sound City will take artists to MU:CON and Zandari, providing a gateway into the exciting Korean music market. Taking place from October 5 – 7, Zandari Festival and its conference focuses on the live and independent sector, with 200 emerging artists performing in 22 venues to 3,000 industry delegates and 15,000 music festival attendees. MU:CON 2019 will take place in late September (dates TBC) and showcases 150 artists to an industry audience of 3,000 at its conference. It has a particular focus on publishing and sync licensing. 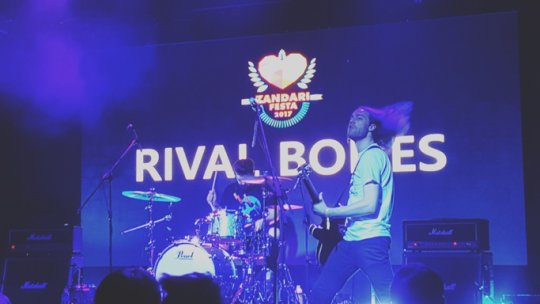 Over the first three years of Sound City Korea, 73 UK artists and industry professionals attended and showcased at Zandari Festa and MU:CON. Industry executives who have attended the showcases to date boast a combined audience reach of 3.2 million across markets including China, Korea, South Korea, Thailand, Mongolia, Russia, Germany, Spain, Serbia, Denmark..
10:30 - 11:15 WTF Is Publishing? 13:15 - 14:00 If You’re Unhappy and You Know It, Sing a Song! 15:10 - 15:55 The Art Of Making Records hosted by Funnel Music and the Music Producers Guild. 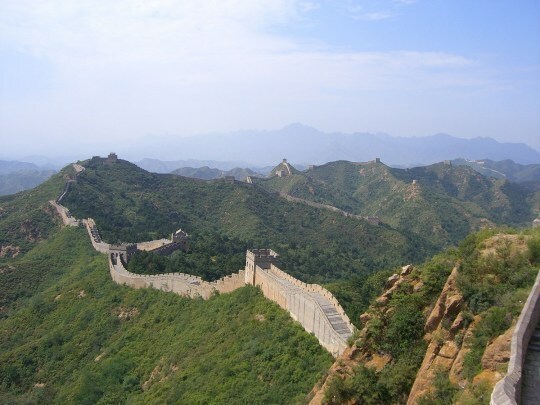 BPI is organising a week long trade mission to China In partnership with The Department for International Trade (DIT) and AIM (The Association of Independent Music) with the idea to boost British music in the ever increasing Chinese market which is consuming more international music than ever before. The week-long mission will include a programme of education, networking, B2B meetings, conferences, showcases and a visit to Sounds of The Xity (SOTX) the biggest music trading event based in China and the only Chinese platform with a long-term commitment to the joint development of the Chinese and Western music industries. Hosted by Sound City’s partner Modern Sky, Sounds of the Xity Conference is the music project which uses a market-oriented method to export Chinese music culture into the world. Its attending delegates from all over the world, are mostly at the top rank within the range of festival organisations they come from. The event covers not just music but technology, fashion, design, and documentary, and its core program of SOTX consists of two elements SOTX EXPO and SOTX FEST. SOTX EXPO devotes itself to taking Chinese music culture abroad using market principles, while SOTX FEST provides customers the most cutting-edge music experience. 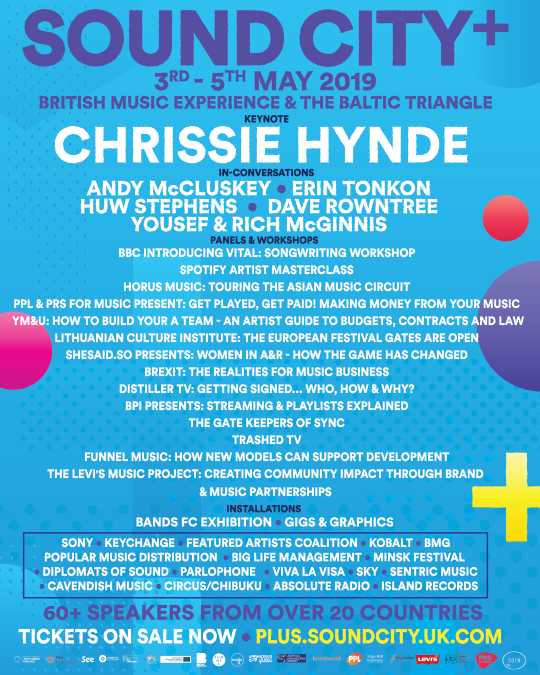 Artists, promoters, record labels, festival bookers, directors and organisers, are being invited to participate in the mission including Sound City’s founder and Director of Modern Sky UK, Dave Pichilingi who will have his own tailored itinerary for the mission. Full schedule for Sound City+ 2018 revealed! The full schedule for this year’s Sound City+ conference in association with Bruntwood has been revealed. Kick starting the bank holiday weekend on Friday 4th May, the 2018 edition of Sound City+ will take over the British Music Experience and Signature Living’s Cunard House, which celebrates the UK’s finest musical exports from the last century inside Liverpool’s historical Cunard Building. The event will welcome music industry faces from all over the world, including representatives from member festivals that make up the Innovation Network of European Showcases (INES) which is supported by Creative Europe. They’ll be discussing the opportunities open to UK and European artists, how the live industry differs in each and how to secure gigs beyond an act’s native borders. Sound City+ will also host a series of workshops aimed at helping young talent make strides in every aspect of their career from sync to distribution to production, as well as personal development in terms of mental well-being and self-confidence. 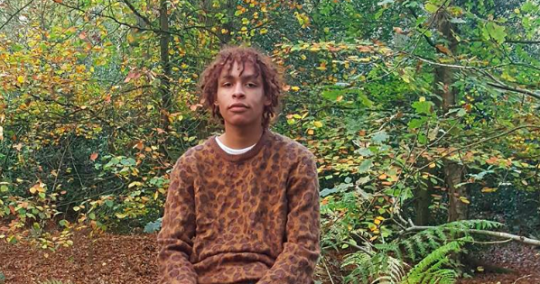 This includes a discussion about imposter syndrome and how to overcome it between Tawiah, an artist from South London, and Fiona Buckland, a life coach whose roster of clients include Google and Soho House. The session is co-hosted by PRS Foundation’s Keychange and Brighter Sound’s Both Sides Now programme. Both Sides Now is a three-year project for young and emerging female artists and industry professionals from the North of England that aims to bridge gaps in access, opportunities and career progression through residencies, commissions, national and international showcases, education and training. PRSF’s Keychange, meanwhile, is a pioneering international initiative that empowers women to transform the future of music and encourages festivals to achieve a 50:50 gender balance by 2022. A special breakfast reception will be held at Sound City+ to support and celebrate the drive. 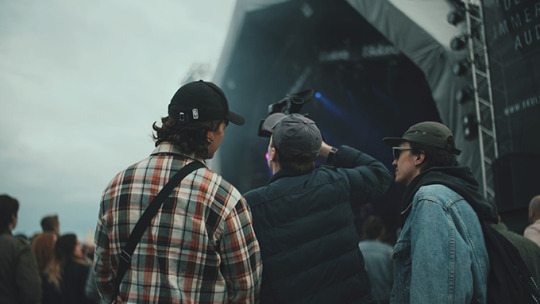 Elsewhere in the programme, Help Musicians UK will support a panel looking at how the music industry and touring can affect the mental health of musicians and managers, and what they can do to improve it for the wellbeing of themselves. Liverpool City Region Metro Mayor Steve Rotheram will also be in attendance, discussing the newly formed Liverpool City Region Music Board, and its ambition to make music an essential thread of the city’s “fourth industrial revolution economy”. Also announced are special In Coversation sessions with legendary label owner and manager Alan McGee, who will be talking about his work with Musicians Against Homelessness, and prolific promoter Vince Power. They are among a diverse list of panellists and speakers including Craig G Pennington (Bido Lito! ), Chris Hawkins (BBC 6 Music), Katia Giampaolo (artist manager), Laura Bohn (artist manager), Guna Zucika (artist manager), Becky Ayres (Sound City), Andraz Kajzer (MENT), Silvia Sardeira (Live At Heart), Delphione Grospiron (Midem), Thomas Heher (Waves Vienna), Casandra Govor (BPI), Kameil Sattar (Proper Music Distribution), Holly Ashmore (7digital), Matt Ross (11 Entertainment), Kirsty Booth (Music Publishers Association), Gareth Smith (Sub Pop Publishing), Dan Moore (BASCA), Dave Connolly (Molecular Sound), Mike Murphy (Ditto Music UK), Andrew Hunt (Music Producers Guild), Dan Cox (producer), Bruno Ellingham (producer), Alex Pilkington (Funnel Music), Tawiah (artist), Giorgio Serra (Exit Live) Fiona Buckland (life coach), Queen Zee (artist), Aidan Culley (Help Musicians UK). Previously announced Sound City+ panels will discuss topics including the modern-day artist entrepreneur, making the jump from local gigs to wider tours, and the potential opportunities of successful sync. The conference is a precursor to the Sound City festival, which will take place across numerous venues within Liverpool’s Baltic Triangle and Baltic Market. More than 250 artists will perform during the two-day festival on 5th and 6th May, with the first wave of acts having already been announced including, DMA’s, The Slow Readers Club, Picture This, Idles, Wye Oak and Black Honey, Peace, Sunset Sons, Yellow Days, Baxter Dury, Jaws and Dermot Kennedy. 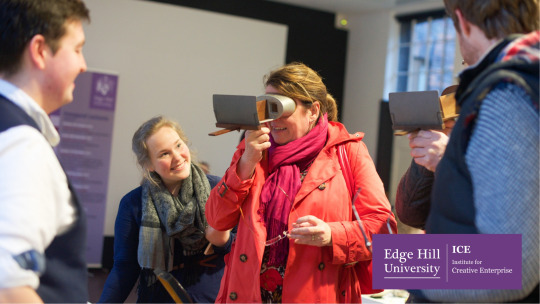 Stealing Sheep Suffragette Tribute Presented in partnership with Edge Hill University and Brighter Sound. 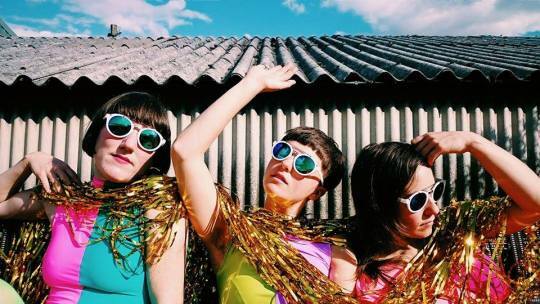 In response to the centenary of suffrage, Stealing Sheep are celebrating women with a performance inspired by the suffragette movement. Co-commissioned by Edge Hill University and Manchester-based creative music charity Brighter Sound, ‘Stealing Sheep’s Suffragette Tribute’ will bring together female drummers and percussionists from the Liverpool area with design, AV and production students to create a marching band and procession featuring brand new music - all inspired by women, equality and empowerment. Property company Bruntwood Group is to sponsor this year’s Sound City+ music conference in Liverpool! Bruntwood Group is a family-owned property company that specialises in creating environments for businesses. It owns, lets and manages more than 100 properties in Manchester, Liverpool, Leeds and Birmingham, employing more than 650 people. The company is committed to making the UK’s great city regions even greater by creating the right places for business success. Landmark Bruntwood buildings in Liverpool include the Cotton Exchange, which has become home to a variety of creative and digital businesses in recent years, and Queen Insurance Buildings, which includes Queen Avenue, the city’s only remaining Victorian arcadeand home to several independent businesses. 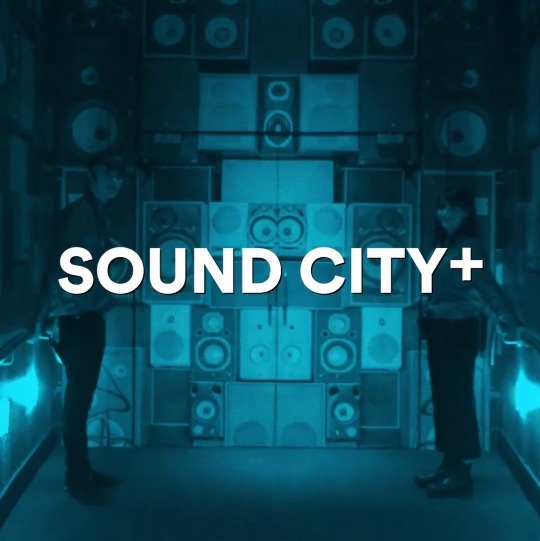 Sound City +, which precedes the Sound City music festival, is the UK’s leading independent new music conference and welcomes a wide range of music executivesfrom across the world. 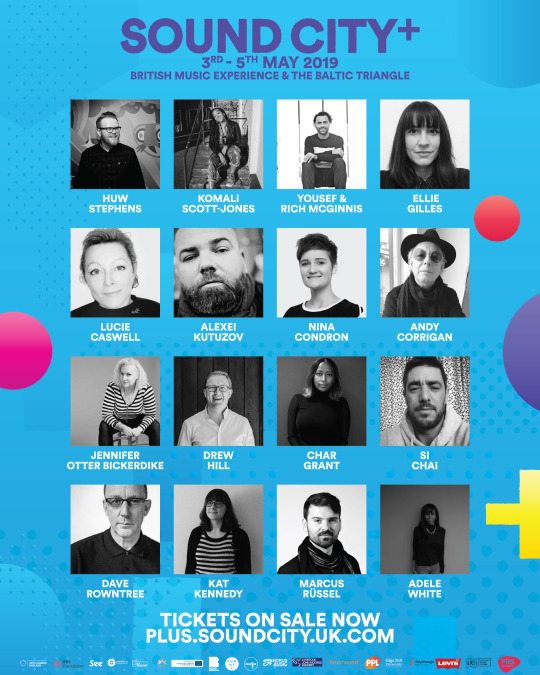 This year’s Sound City+ takes place on Friday 4 May at the British Music Experience in the Cunard Building, ahead of the festival at the Baltic Triangle and Cains Brewery on the weekend of 5 and 6 May. Sound City is incredibly proud to be a part of Keychange! We pledge to tackle gender inequality by empowering women to transform the future of the music industry, whilst encouraging industry conferences and festivals to achieve a 50:50 balance by 2022.